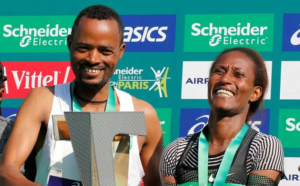 Ethiopian athletes Gelete Burka (women’s race) and Abrha Milaw (men’s race) won the 43rd edition of the Paris Marathon. They led a record 60,000 participants to the finish line through the French capital. Milaw won the men’s race with a time of 2 hours: 07 minutes and: 50 seconds. Burka was the fastest woman with 2 hours: 22 minutes and: 48 seconds.